Unfortunately houses need locks. No lock will prevent a thief from breaking in, but it can be good enough to make it very difficult to break in, and may discourage a thief. Like many things, locks only are effective when they are used. The best lock is useless if you leave a window open. The standard doorknob isn't a very effective lock. There is the knob itself, which is easy to grab and pry on. It isn't very difficult to simply pry the knob off. Similarly, the doorknob bolt doesn't go very far into the door, and is shaped in a way to maximize convenience, and minimize security. The common solution (in North America) is the deadbolt. 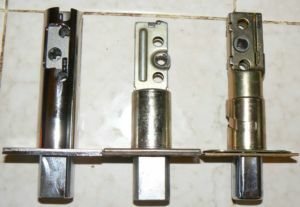 There are many different deadbolts available. I will go over some and point out some important points. Most locks are pretty easy to pick. With a few days of experience, you can open most locks in under 5 minutes. I have personally picked Schlage and Kwikset deadbolts. Not because they are easy, but because they are easily available to me. The solution to this is so called 'high security' locks, of which there are a variety. If picking wasn't bad enough, there is a technique called 'lock bumping'. You cut a key to the lowest level for all pins. You make a few other modifications which can be done in a minute or two with a file. Now, with a screwdriver or small hammer, and the bump key, you can open almost any lock, including many so called 'high security' locks. The solution to lock bumping is real 'high security' locks. There are only a few which I trust. I have seen pick tools for Mul-T-Lock. Mul-T-Lock picking I have also seen them bump picked. Mul-T-Lock bump key The older Medeco locks are generally considered hard to pick, though the newer ones have possible picking or other issues. Picking a M3 Medeco Opening a M3 Medeco with a screwdriver and a shim Assa makes high security locks which are somewhat similar to the Medeco locks. Schlage has the Primus lock which are somewhat similar to the Assa. I seriously considered upgrading my Schlage deadbolts to have the Primus locks. I didn't find a dealer to help me. It is likely it would have been a pretty secure solution. It is interesting to note that Abloy's real name is Assa Abloy, as they own Assa. They also own Corbin Russwin, Medeco, Yale, Chubb, Mul-T-Lock, and many other lock companies. There is another high security lock, called Bilock. It has two rows of pins, and two separate sidebars. It seems to be reasonably secure. I have seen videos of it being picked in a few minutes. It is more secure to have a double deadbolt, that is a deadbolt with a lock on the inside as well as outside. That way, if a thief gets inside, they won't be able to exit using the door. The downside to this, is in an emergency, people won't be able to exit the house without a key if the deadbolt is locked. 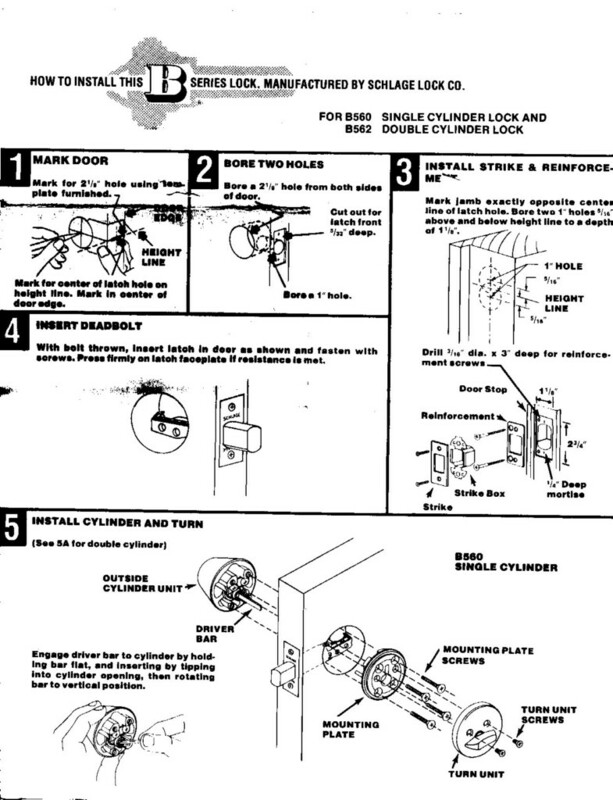 Double deadbolts are only recommended in buildings without people, such as garages. Some companies including Medeco and Abloy have locking thumbturn double deadbolts. The inside is normally operated with a thumbturn mechanism, but when you leave, you can lock the thumbturn so that it requires a key to open. This combines the features of a single deadbolt with the security of a double deadbolt. Medeco makes high security deadbolts (as well as padlocks). They have a normal looking key, until you look closely at it. When you do, you will see that the places where the pins engage the key are cut at an angle to the key. That is the top of the key where it goes up and down isn't flat, but slopes right or left for each pin. In order to open the lock, each pin must be at the correct height, and at the same time, each pin must be rotated by the key to the correct rotation. Then a 'sidebar' engages, and the lock opens. Kwikset has introduced a new lock called the SmartKey which is virtually identical to the Weiser SmartKey. It is supposed to be very hard to pick and unbumpable. I have read it takes a skilled locksmith about 30 minutes to pick. They are pretty cheap. One really nifty feature is they can be rekeyed quite easily. Just insert the old key, turn 1/4, insert the learning tool, remove the learning tool, put in the new key, turn back 1/4, and the key is changed. This makes it trivial to get any number of matching deadbolts. I have also heard that even though the lock is rated ANSI grade 1, it isn't very mechanically robust. It is likely the best value currently available. You can even get doorknobs with the SmartKey feature. About $25-30 for a single deadbolt, and $35-$40 for a double deadbolt. Abloy makes a variety of locks including padlocks, deadbolts including single deadbolts, double deadbolts, and thumbturn deadbolts. Rather than using pins like most other locks, Abloy uses 11 disks that rotate, though only 9 are used to make the specific key combination. There are no springs involved. For the Protec locks (the current model) there are 1.97 billion possible combinations. The Abloy is generally regarded as hard or impossible to pick. When I bought my house, I decided to change the locks. I have 3 doors, so I needed 3 deadbolts. I went to Home Depot, and looked at their locks. I decided on buying the Kwikset Titan. They were reasonably priced, and they had 6 pin tumblers which should make the lock harder to pick. I searched the stock until I found 3 that had the same key. This was a hassle, and is one of the nifty features of their newer SmartKey system. They are ANSI grade 2 (which I didn't realize was not so secure), and cost about $30 for a deadbolt and a doorknob. I installed the locks. Later, I was speaking to a locksmith who told me he had some Schlage commercial deadbolts for sale. They were the B560 (single deadbolt) and B562 (double deadbolt). This isn't their new B-560, but an older design which features 4 thick bolts that connects the front of the lock to the back of the lock. The box says 'superbolt', though I am not sure if it is because of the 4 thick bolts or the heavy duty deadbolt.. It requires the 2 1/8 inch sized hole in the door in order to have room for the 4 bolts. The cylinder has room for 6 pins, though only 5 pins were used for my keys. 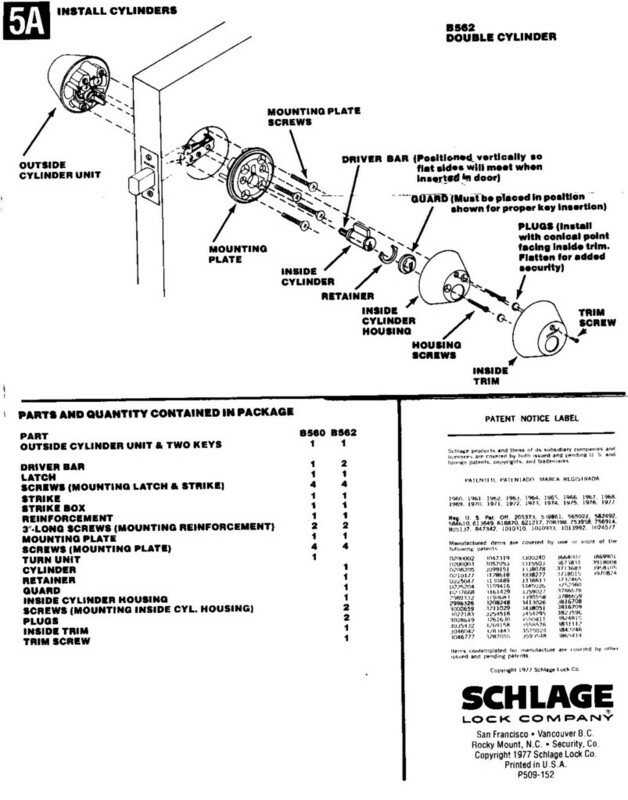 Unfortunately, Schlage has discontinued the locks I bought, the B560 and B562. What is worse, they have other locks with the same name. Not very clever. Fortunately, I kept my installation instructions, which you can see below. Note the 4 thick screws that go through the mounting plate and secure the outer cylinder unit. Also note the long driver bar that goes through the actual deadbolt and into the turn unit. For the double deadbolt, the B562, there are two driver bars that pass each other. Click on the pictures to make them bigger. Unfortunately for me, after I bought the Schlage locks, I realized the locks were not as secure as I had hoped. I decided to get the most secure locks I could find. This turns out to be Abloy. 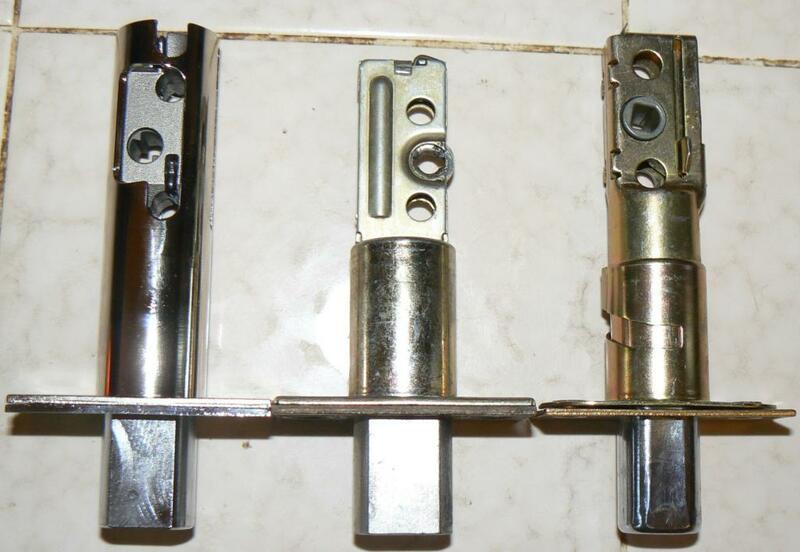 I ordered two thumblocking deadbolts and one double locking deadbolt from Han Fey Not only does he carry Abloy as well as a variety of other high security locks, but he is a well known expert with respect to high security locks, and has written several articles about high security locks. He also had very good prices :-) The locks took a bit longer to order than he had hoped (as deadbolts aren't very common in Holland), so he included an Abloy 330 padlock even though I didn't even ask for it. In addition, he shipped the locks before I paid owing to some difficulties with electronic bank transfer. After a few years, two out of three of the deadbolt bolt springs have failed. They have been replaced free of charge. There is a known problem with some of the older bolt springs, and Abloy has a newer, improved design than my original bolts. Jun-2014 Well, another bolt broke. I am not sure if it was the old design bolt or the new design bolt. This one got stuck partially out, which meant the door wouldn't open. I was able to disassemble the lock. With the lock disassembled, I was able to access part of the bolt. There is a hole that has some tabs that can be turned, rotating the bolt. Turning that didn't release the bolt. I decided before I cut it into pieces, I would try to use some force. Using more force that I would on something I wanted to keep, I was able to release the bolt. I don't know why it was so hard to release. I sent it back and got a replacement bolt. I suspect abloy needs to do some work on their bolt design to make it reliable. Aug-2016 Yet another bolt spring broke today. I had 2 spare bolt interiors, and I swapped it out without incident. When the bolt broke the door would not open, so I had to take the lock apart to open the bolt so I could open the door. At least it opened easily unlike the last bolt spring that broke. This is my fourth broken bolt spring. I sure hope it is the last one. 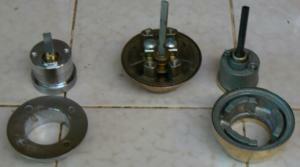 I will now compare three types of deadbolt, the Abloy, the Schlage and the Kwikset. The Abloy bolt looks quite substantial. The Schlage bolt looks even more substantial. The Kwikset looks less substantial. The Abloy has a quite substantial strike plate. It is really a box of steel welded to a strike plate. Another flat strike plate covers the box strike plate. The back of the strike plate box has two holes (which are offset from the center) for 2 inch long wood screws to go into the frame. The Schlage has a incredibly flimsy sheet metal strike plate box. It does have a quite substantial strike plate (you can see it is thick) with offset holes for big bolts. On top of that is a finish plate. (I am not 100% sure this plate is the factory Schlage plate, but it is the one I found in the Schlage box). The Kwikset does have 3 inch bolts for the strike plate, but the plate itself is quite flimsily. The Abloy inside is one piece which makes sense because there is an internal lock as well as turning mechanism. The 2 bolts that hold the lock together screw into the inside part via a clever hole in the turning mechanism. 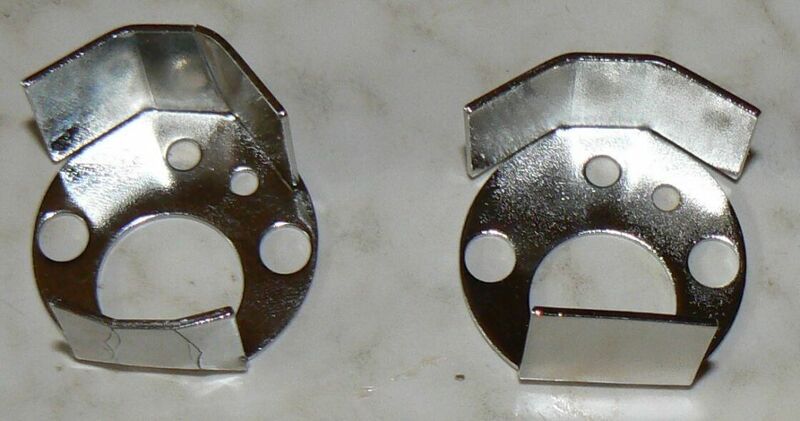 The bolts are only accessible when the turning mechanism is unlocked. The inside of the Schlage has a robust plate where the 4 bolts screw into. 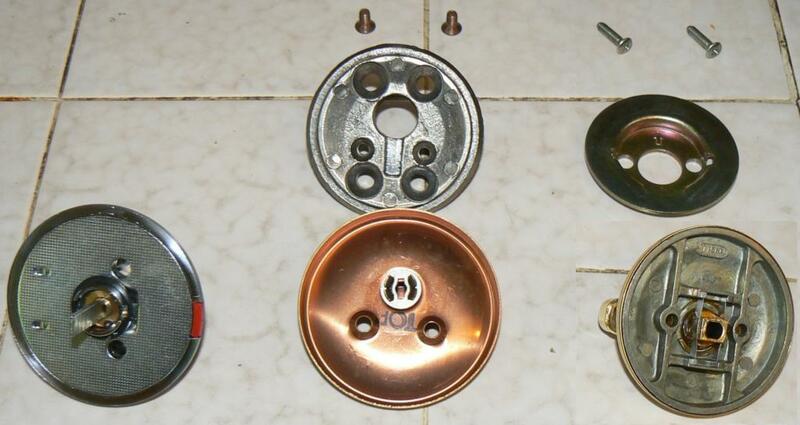 After that, there is a cover plate with 2 trim screws which contains the turning mechanism. The inside of the Kwikset has a plate where the 2 bolts screw into. After that, there is a cover plate with 2 trim screws which screw into the hollow ends of the 2 bolts that hold the lock together. Note the Schlage bolts are quite thick, and there are 4 of them. The Abloy and Kwikset bolts are roughly the same size, but the shoulder of the Abloy is pretty small, and is all that holds the lock together. In my opinion, they look too small, and I recommend Abloy switches to bigger, thicker shoulders. If they don't I would like to see a good explanation showing that the existing shoulders are strong enough. 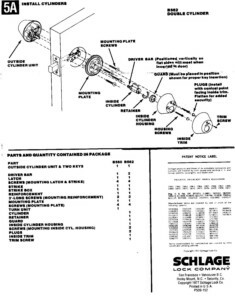 The instructions for the Abloy is mostly pictures. A few more words would have been helpful. The first thing I noticed was the icepick shield was too big to fit the 1 3/4 inch hole in my door. I didn't measure the hole, but the door is a heavy steel door that was factory drilled, so I assume the hole is the correct size. I had to bend the icepick shield bottom flat part, as well as the top 'hat' parts a bit to make it fit, and even then it was quite tight. The next thing I noticed was I couldn't put the lock together. It turns out there are tabs that extend from the front and from the back. You have to break them off at the right distance so they are long enough to engage the deadbolt mechanism, but short enough to not press against each other. The instructions didn't say anything about this, and there were no pictures to show what to do. 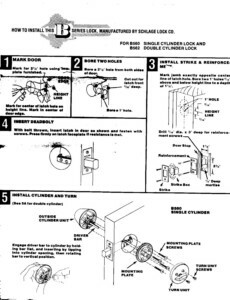 Fortunately, I found a blog describing what was required to install the locks. I trimmed the tabs and the lock would bolt together. I really don't like this. The problem is if you get a thicker door, you will need to get longer tabs. They don't look very user-replaceable. The Schlage and Kwikset didn't require any tab trimming to work. The Thumblock has a very elegant way to tighten up the bolts. On a deadbolt with a lock inside, you have to make it hard to take apart when locked. 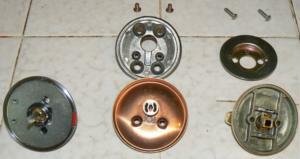 The classic solution is to put ball bearings over the bolts, or mush metal disks over the bolts. This works, but makes it really tough to take the lock apart, should you ever feel like it. You will likely damage the lock taking it apart, and it will take quite a bit of effort. For the Abloy, they hide the bolts under the thumbturn device. When the thumbturn is unlocked, it can be rotated and expose the bolt holes. Very clever. So clever in fact that if I had know about it, I would have ordered all my locks to be locking Thumbturn. But Abloy doesn't mention these details on their web pages. I was unable to tighten down the bolts fully, and the lock could be moved from side to side. What is worse, I could get my fingernail under the outside deadbolt case. After thinking about it for awhile, I realized that the bloody tabs were in fact pushing against each other. I had emailed Han Fey, who confirmed my idea. I took the lock apart, and very carefully filed down the tabs so they wouldn't push against each other. I then reassembled the lock, so it wouldn't move from side to side and I couldn't get anything under the outside. However, I still couldn't really tighten down the bolts as much as I would like, as it would cause the lock to bind up. I ended up carefully filing down the tabs a bit more, and now I can tighten down the lock fully. The instructions were quite vague on this point. Another thing I don't like is the lock is secured with two allen bolts with very small shoulders. It is only these two shoulders holding the lock together. I would have preferred standard shoulder allen bolts. I question if these are strong enough. They certainly are much less strong than the 4 big bolts of the Schlage. I don't have any proof these two small shoulders are inadequate (and the lock does have an ANSI grade 1 rating), I just suspect them. I then installed the strike plate box. I had to do some wood chiseling in order to make it fit in my door frame. What I did not expect was I had to enlarge the top and bottom of the steel hole in the door frame, as the steel box of the strike plate was too tall to fit in the hole in the door frame. I suspect that the box is a bit oversized. This isn't generally a bad thing, as doors aren't always perfectly aligned. However, my steel door was very well aligned, and I wasn't happy having to remove metal in the door frame hole to allow the strike plate box in. I would have been happier if the box was smaller. Overall, I am quite satisfied with the Abloy locks. I think they are more robust than the heavy steel doors I put them on. I think they are better than any other mechanical locks I could have bought for my doors. See my other page (to be forthcoming) about basic house security. When I bought my house, I decided to replace the locks. I went to Home Depot, and bought Three combination deadbolts and doorknobs that were Kwikset Titans (and happened to be keyed alike). They were ANSI grade 1, and had a lifetime warranty. They also had 6 pins rather than the more common 5 pins of other Kickiest (and most other home) locks. Abut 18 years later, a doorknob failed. Kwikset no longer makes the Titan. They replaced the doorknob with a SmartKey, which is likely a more secure lock. A second doorknob failed recently. I called Kwikset and they sent out a replacement SmartKey doorknob for a replacement. Both locks failed in the same way - the inner locking mechanism became hard to turn. When I had the lock apart, I looked at it (hoping to fix it). The inner doorknob basically has nothing inside to fix. 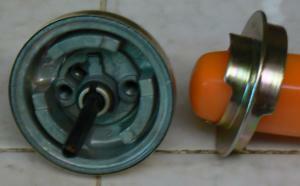 The mechanism that failed is in the outside door knob, and it not obvious how to service it. There is a clip that holds everything together that I decided not to remove. I suspect that the mechanism needs to be greased or lubricated in some way. They are reasonably well made locks, but not as reliable as my Schlage locks. The SmartKey allows someone with the existing key and the change key to rekey the lock in a few seconds. This is really quick and simple to do. It also is said to be resistant to 'bumping', which is true, as I have disassembled a lock. It does not use pins and springs, but rather a different type of mechanism. I don't like the way the doorknob installs however. Like the Titan, the doorknob is held together with two bolts that go through the door to hold the inner and outer doorknobs together. Unlike the titan, it is possible for the bolt to fall through the inner knob and end up inside the door. This is because the Titan has a circular hole that the bolt goes through that is smaller than the bolt head, making it impossible for the bolt to slip through. The SmartKey has a hole that is shaped roughly like an open U. It is easy for the bolt to slip into the door if the bolt does not line up properly with the inside mechanism while assembling it. I know, because it happened to me. I have no idea why the hole is U shaped and not O shaped, which would prevent this from happening. In a solid wood door, this would not be a problem, but I have a hollow core steel door. As one would expect, the bolt fell the the bottom of the steel door, where it is rests today. Perhaps if I was very lucky, I could use a magnet to extract it. However, since it is a steel door, and steel is magnetic, I think my chances of success would be small. Fortunately, I had the bolts from my Titan, and I was careful and did not let the bolt slip through again. The U shaped hole is an idiotic design choice. If you use this lock and have a hollow door, be very very careful not to let the bolt slip inside the door.